The new Dean of Mahidol University International College (MUIC), Assoc. 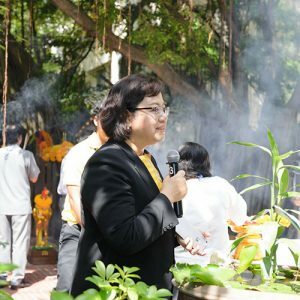 Prof. Chulathida Chomchai, began her first day in office on October 1, 2018 with a ceremony to pay her respects to the Chao Por Khun Toong shrine at 10:00 am, joined by her executive team, faculty and staff members. Afterwards, she had a brief meeting with her executive team, followed by a buffet lunch at noontime attended by the MUIC community.